The red, portable Executive Turntable from Crosley Radio features stereo full-range speakers and a USB port for computer recording with the included software suite. The belt-driven turntable includes a diamond stylus and allows you to listen to your favorite 7, 10, and 12" records at speeds of 33-1/3, 45, and 78 RPM. A connection for a portable audio player is provided via 3.5mm jack and the included auxiliary audio cable. The stereo RCA output can be connected to a sound system, while a headphone output is provided for personal listening enjoyment. The vinyl-wrapped wooden enclosure features brass plated hardware and a leather handle for ease in transportation. The Executive ships with a DC power supply and a 45 RPM adapter. Record Size: 7, 10, 12"
Executive Portable Turntable with USB and Recording Software (Red) is rated 5.0 out of 5 by 1. Rated 5 out of 5 by Anonymous from I would buy this product again and again The best thing I bought! Can this record player run on batteries? 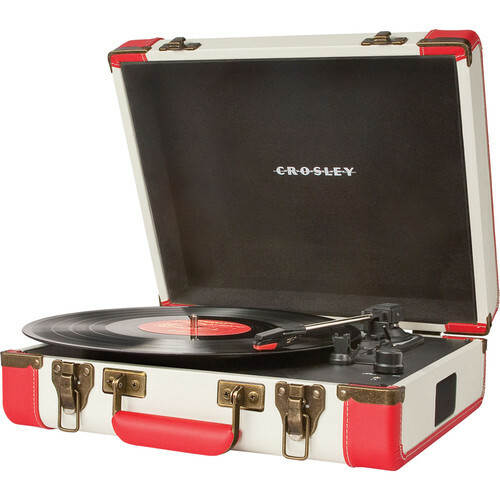 I'm sorry, the Crosley Radio Executive Portable Turntable cannot be powered by batteries. Does the Executive Portable turntable have a fully automatic tonearm? The turntable is not fully automatic. The tonearm must be placed on the record and removed manually. Hi .Is this product can work 220 wolt ? No. This device operated on 120V AC 60 Hz only.